With changing leaves and crisp morning air, 'tis the season… of hot chocolates, pumpkin spice lattes, macchiatos, coffees, and black teas! These lovely drinks warm our hands and our hearts, a staple of cold weather. 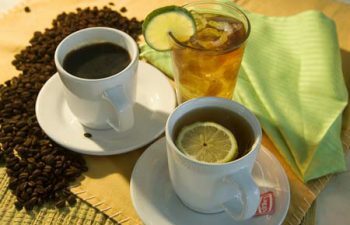 In fact, for most of us that morning caffeine fix is a necessity that continues in various forms throughout the day–be it coffee, tea, or cola. However, it should come as no surprise that the things we eat and drink can stain our teeth. Unfortunately, when one begins to consider caffeinated beverage of choice and which will stain teeth less–coffee or tea–it can get rather confusing. To obtain a clear understanding, we should first take a look at the science behind the chemical compounds that cause coffee or tea to deposit stains. First, what makes coffee stain? Polyphenols are large molecules that contribute to aroma and color we associated with coffee. They also play a role in staining our teeth. During coffee roasting, the heat that is applied to the beans breaks down these polyphenols, thus the darker roasted coffee produces less tooth staining. This news is quite welcome for coffee drinkers out there! What about tea? How does it compare to coffee? One would think that since tea is not as dark as coffee, it would stain less. Nonetheless, it is tea, specifically black teas, which stain teeth more than coffe by a noteworthy amount. Why? Because while the polyphenols in coffee are broken down by heat, black teas achieve their color through oxidation–an enzymatic process during which the polyphenols combine to form larger, highly staining molecules that have an affinity for the protein pellicle of our teeth. This means the tea actually 'sticks' to our teeth better than coffee. What to do about discolorations? Notwithstanding, most of us are not going to give up our morning 'aahh' of coffee or tea. There are many options to reduce the staining on our teeth, or eliminate it altogether. Please stop by or call and ask us about what we can do to make your smile brighter!